The 16th century in Norwich was a time of change. The financial prosperity of the medieval wool trade was on the wane but in spite of this a number of fine monuments and buildings were erected. The Bacon Family built a grand abode on Colegate (NHER 172); with Henry Bacon’s merchant’s mark occupying the top left spandrel of the doorway. The medieval Market Cross was also reinstated and repaired in 1503 (NHER 651). The removal of monasteries in the 1530s and 1540s also freed up land for new development, and one such individual who took advantage of this was the Duke of Norfolk who built his Palace (NHER 169 and 463) on land reclaimed from the Dominican Friary. Those monastic structures that did survive were either put to new uses, such as the Carnary College (NHER 619 and 26082) which became a grammar school, or re-founded like the Great Hospital (NHER 624). Nevertheless, several of Norwich’s medieval churches fell out of use as a consequence of the secular reshuffle including St Mary Unbrent on Magdalen Street (NHER 582) and St Martin in Balliva (NHER 569) on Ber/Golden Ball Street. In some cases new uses were found for redundant churches with provision for the influx of French and Dutch migrants who came to work in Norwich as part of the new textile industry. The church of St Mary the Less was known as the ‘French church’ and Blackfriars Hall (NHER 194) was used as the Dutch church. In addition to the religious reformation, 16th century Norwich experienced a period of civil unrest. The rebels of Robert Kett’s peasant’s revolt set up their headquarters on Mousehold Heath before attacking the city, in the process damaging the Cow Tower (NHER 632) with cannon fire. With the rebellion quashed the inhabitants of Norwich turned towards revitalising public works. William Gibson built a conduit (NHER 703) on Lower Westwick Street and Whitefriar’s Bridge (once the Bridge of St Martin), which crosses the River Wensum north of the Cathedral, was rebuilt in stone in 1591 (NHER 616). However, it was still the case that many of the residential buildings destroyed by the fire in 1507 were yet to be rebuilt. Many properties along Pottergate (e.g. NHER 26152 and 26369) were not restored until the 17th century including the grand Colman House (NHER 26366), which saw use as a hospital in the 19th/20th century. This evidence was provided by archaeological excavations at Pottergate in the early 1970s as part of the Norwich Survey (e.g. NHER 149). Additionally, the majority of buildings on Elm Hill had to be rebuilt after this fire. As such, with the exception of the Britons Arms which stands apart from other structures, the picturesque timber-framed buildings that line this cobbled street date to the 16th century onwards, with the finest examples being Nos 2-4 (NHER 26370) and 22-24 – known as the Stranger’s Club (NHER 26096). By the beginning of the 17th century Norwich was flourishing as the new textile manufacturing industry began to take off. Weaving was a crucial industry, demonstrated by the Bridewell Museum (NHER 607) holding the Weavers coat of arms. Textile production occurred not only in traditional weaver’s workshops (NHER 26338) but also in factories (NHER 26427) on a large scale. The growing population required new housing and a number of timber-framed flint and brick buildings sprung up. A few of these survive in King Street (NHER 718) and are typical examples of the 17th century domestic housing of Norwich. The market (NHER 40773) became an important centre for trade at this time and ensured Norwich was a centre of regional importance. 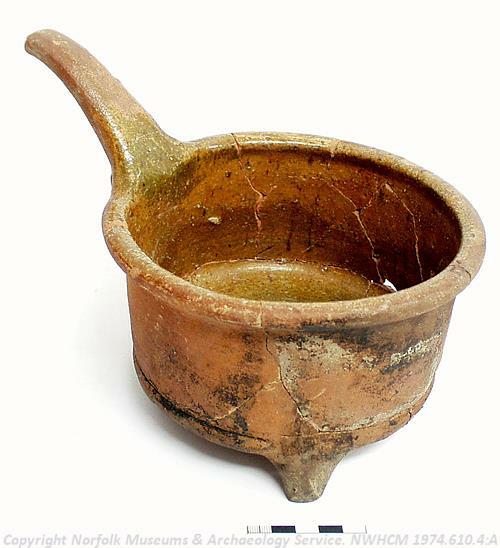 This trade is hard to see in the archaeological record but is characterised in a number of imported pottery types such as Westerwald stoneware (NHER 311) and Dutch slipware (NHER 349). The Non-conformist movement rose to prominence in Norwich during the 17th century. Several of the chapels built by its members survive as fine listed buildings. Prominent examples include the Old Meeting House (NHER 26086), the oldest non-conformist chapel in Norwich, and Octagon Chapel (NHER 26087) built by Thomas Ivory. Both of these fine buildings stand on Colegate and are well worth a visit. The enlightened environment of the city was perfect for philosophers and theologians and Sir Thomas Browne, a famous 17th century polymath, lived in Norwich from 1637-1682. His house was situated at 3-5 Orford Place (NHER 92) and the grand ceiling from the study is held by Strangers Hall Museum (NHER 606). Indeed, Browne was such a local celebrity that a bronze statue was built in 1905 at Hayhill which shows Sir Thomas in a contemplative pose (NHER 47491). By the late 18th century the new textile industry was booming, providing wealthy merchants with the finances to build grand homes, like No 9 Surrey Street, built by Robert Mylne, which served as the early offices of Norwich Union (NHER 26207). Of course this was not the only industry in Norwich operating successfully. The well-established practice of quarrying continued in the areas of Ber Street, Rosary Road and Earlham during the 18th century. A number of quarry pits and shafts have also been reported from elsewhere, suggesting widespread activity (e.g. NHER 26407 and 26420). Norwich also had several breweries in operation at this time including the Anchor Brewery (NHER 26490) in Coslany Square which was built in 1773, although the only surviving buildings here date to 1857 and 1868. This developing society embarked upon a programme of civic building. This included the construction of everything from Bethel Hospital (NHER 13), founded in 1713 to house the mentally ill, to pleasure gardens like the Wilderness (NHER 26487) which had splendid clockwork sheep! However, despite the prosperity of the previous century, the vast majority of Norwich’s population were still housed inside the medieval walls (NHER 384) during the 18th century. Therefore, a great deal of renovation of old properties occurred at this time. This included the buildings in The Close, an area which had become very fashionable by the end of the 17th century. The present day buildings here have mainly Georgian facades and stylings as illustrated by No 2 (NHER 26041) and No 74 (NHER 48266) for example. It is also worth noting that by the 19th century the Close was home to a large bronze statue of Nelson (NHER 47962), with one of Wellington (NHER 48089) added in the subsequent 20th century. It was in the 19th century that the first suburbs appeared in Norwich. The typical houses of these extramural housing developments were terraces constructed from brick with slate roofs. Examples of these suburban terraces can be seen along Unthank Road (NHER 48015), Earlham Road (NHER 47955 and 48198) and Bracondale (NHER 48260 and 48261). These new homes were needed to house the workers required by the new industrial city. Many of these industries related to production of foodstuffs including flour at the City Flour Mills on King Street (NHER 26126), mustard at the Colman’s factory (NHER 26409) on Carrow Road and beer at the malthouse on Kerrison Road (NHER 38193). At this time Norwich also had a flourishing boot and shoe manufacturing industry with a number of factories (NHER 26386) across the city of which the foremost was the Norvic one on Colegate. A corn hall, required to sell the large quantity of grain entering the city from suroounding farms, stood on Bedford Street from 1861 until its demolition in 1964 (NHER 53). Anglia House was another such building having been erected in 1882 as an agricultural hall to organise the distribution of produce within the city. This grand building is now better known for its use as the Anglia Television Centre. Other more unusual manufacturing industries include the production of organs at Norman and Beard's factory (NHER 41055) which was the most extensive and advanced works of its date in Britain. 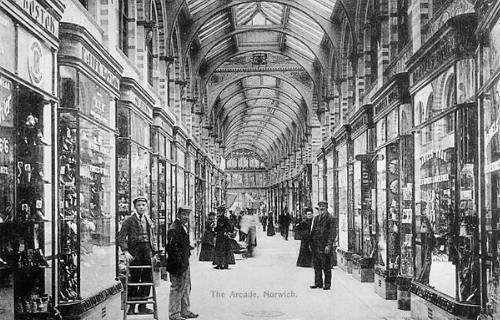 The Royal Arcade, Norwich. Courtesy of Norfolk County Council Library and Information Service. The 19th century was also notable for the erection of several cast iron bridges. The best example is the Duke’s Palace Bridge (NHER 640) which was built in 1822. It was dismantled in 1972 but was re-erected in 1991 at the Castle Mall shopping centre. Foundry Bridge, which serves Thorpe Station, is another member of this group of bridges having being rebuilt with iron latticing in 1844. Other similar bridges crossed the Wensum at various points in the 19th century, and these included Old Carrow Bridge (NHER 842) and the 1804 incarnation of St Miles’ Bridge (NHER 614). At this point it was also clear to the inhabitants of Norwich that further public amenities were needed to deal with the increased population. The most important of these was the introduction of rail services to the city. Norwich had three stations: Norwich Thorpe (NHER 332), City Station (NHER 13584) and Norwich Victoria (NHER 13578). Thorpe station became the main station in 1916 after the closure of Victoria station, which is now occupied by Sainsbury’s Supermarket. City Station, which provided services westward across Norfolk, closed in the 1960s. Much of modern Norwich Thorpe station dates to 1886, with the original engine shed being demolished in 1994. Two municipal cemeteries were also built at Rosary Road (NHER 26477) in 1819 and Bowthorpe Road (NHER 26484) in 1856. The latter cemetery was necessitated by the closure of all the churchyards in Norwich by the Home Secretary. Organised sanitation was also important and this period saw the construction of the Heigham Waterworks (NHER 26486) after the cholera outbreak of 1859. More basic needs were catered for by the drinking fountain known as the Tombland Obelisk (NHER 26526) and the installation of a concrete urinal (NHER 26471) on St Crispin’s Road! As such the archaeological records show that by the end of this period was a typical commercial city with a diverse economic base, functioning public services, fine civic buildings/monuments and a diverse range of residential housing.